You can rescan a backup repository configured in the backup infrastructure. Backup repository rescan may be required, for example, if you have archived backups from a backup repository to tape and deleted backup files on the backup repository. Or you have copied backups to the backup repository manually and want to work with them in Veeam Backup & Replication. 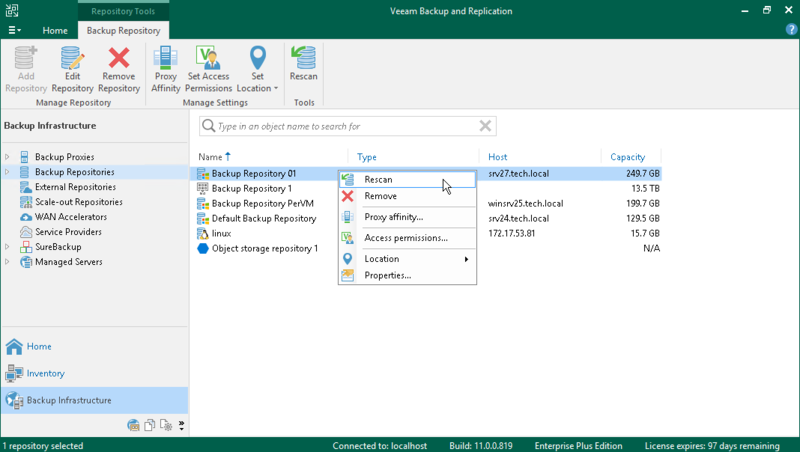 During the rescan operation, Veeam Backup & Replication gathers information about backups that are currently available on the backup repository and updates the list of backups in the configuration database. In the working area, select the backup repository and click Rescan Repository on the ribbon or right-click the backup repository and select Rescan repository.